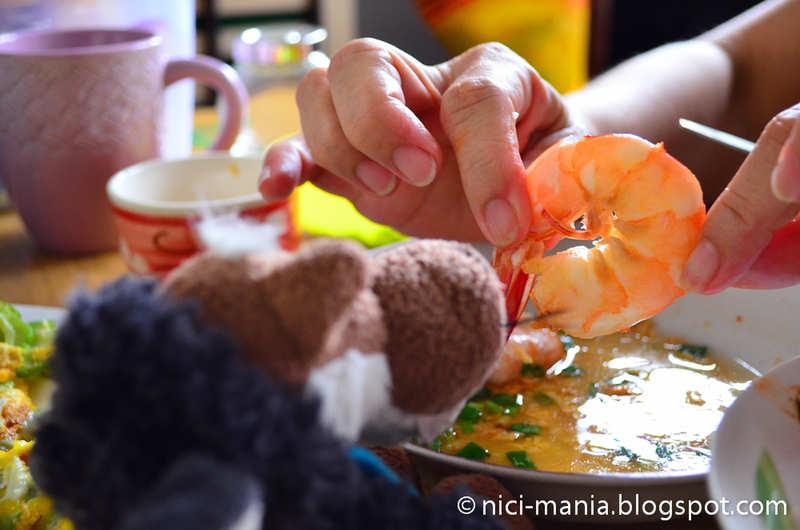 Welcome to garlic prawn recipe version 2, the fresh prawn episode! If you remember our previous garlic prawn recipe, we used cheap grey prawns but today we have very fresh sea prawns. So we decided to do a different garlic prawn recipe. Today's main ingredient, our prawns are crazily fresh from the sea bought from a fishing village. 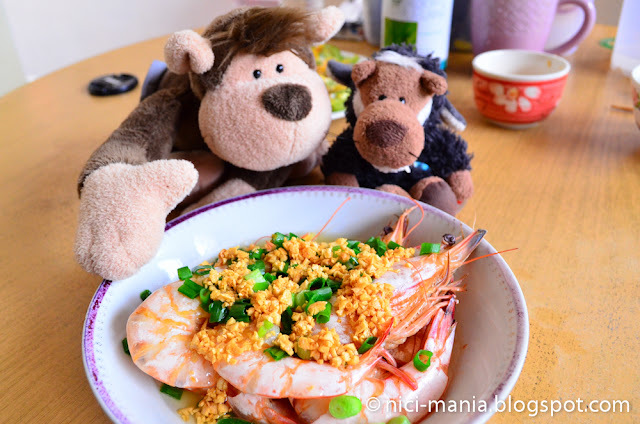 Hugo Wolf and NICI Monkey are both extremely excited for the garlic prawns. 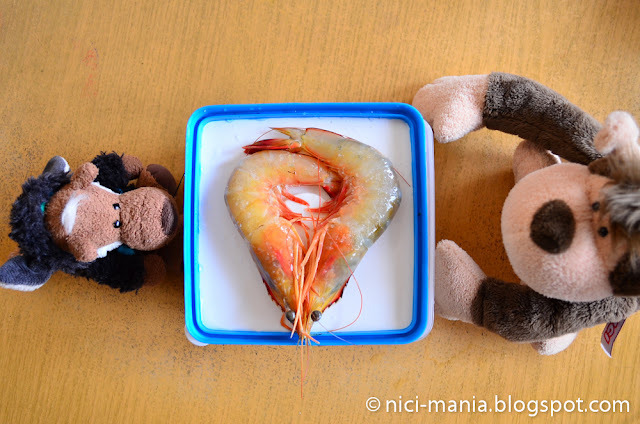 Prawns in love! This version of garlic prawn recipe is very very simple. Because our prawns are so fresh, we are not even gonna trim the prawn head or remove the prawn intestine because there isn't any dirty intestine in the prawns anyway. 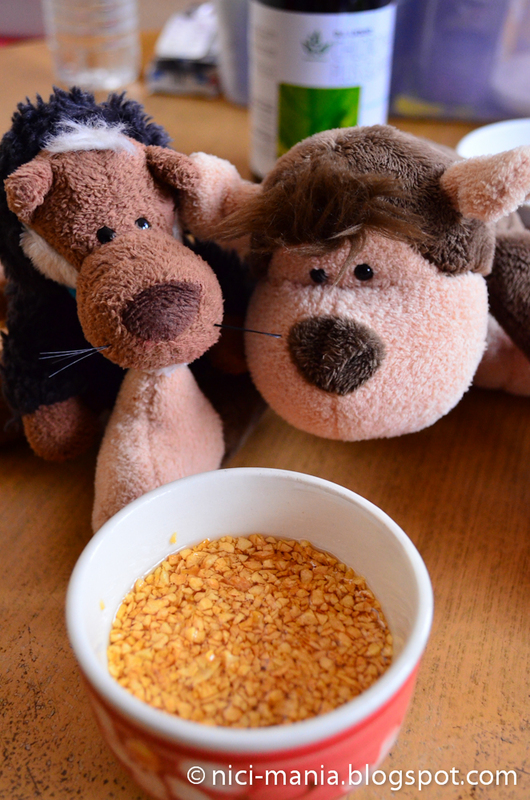 We just sprayed a teaspoon of salt over the prawns. Let us deal with the garlic first. 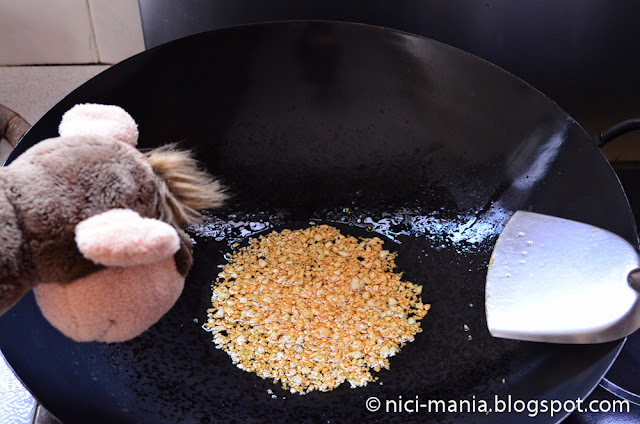 We dice up a whole bulb of garlic finely, then fry the garlic in oil under medium fire. Keep stirring the garlic non stop, it will take about 5-7 minutes until the garlic start turning slightly golden-brown like what you see in the picture. Turn off the fire. With the fire turned off, it will take a minute or so and the garlic will all turn golden brown like this. 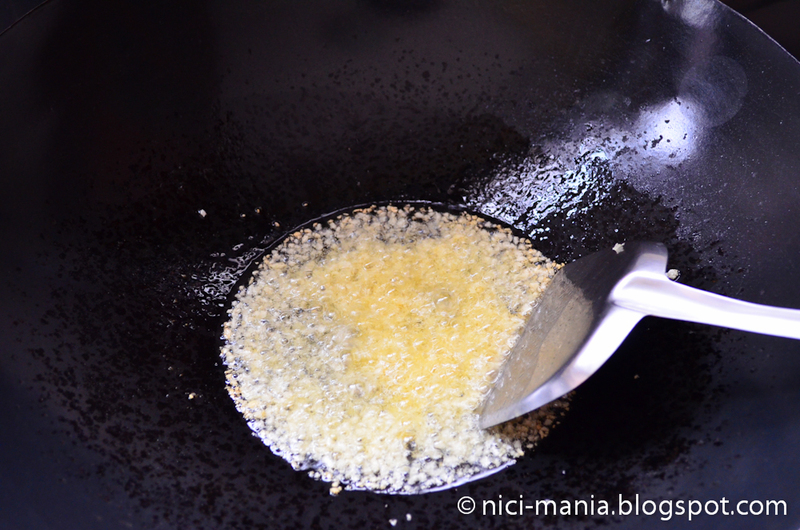 Frying garlic is an art, you have to be patient go slow and stir with the flow. Garlic needs time to be fried thoroughly to be crispy and fragrant, thats why we only use medium fire. Nicely fried garlic in oil. The most difficult part of our garlic prawn recipe is done, the rest is just a stroll in the park. Next we prepare one stalk of spring onion and chop them up nicely. 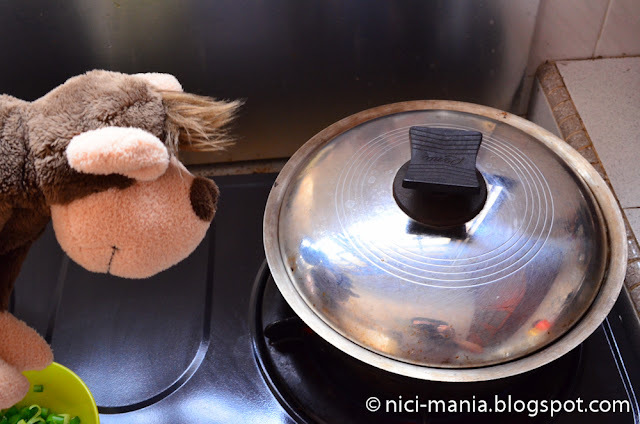 Prepare a pot to steam the prawns. Heat up the pot and bring the water inside the pot to boil. Be warned!! 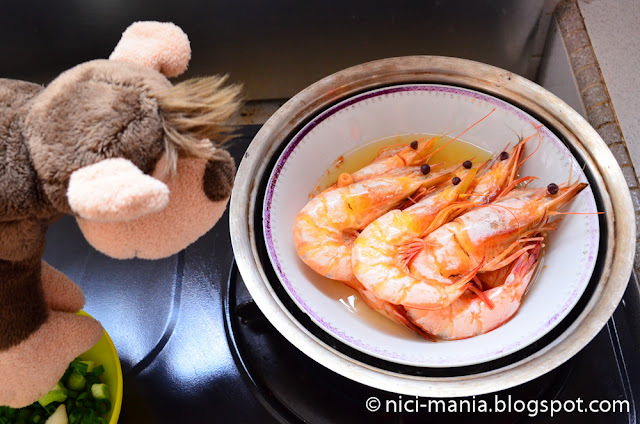 Prawns get cooked very easily within 3 minutes in the steamer, to get the best cooked prawns, preheat a plate (to put the fresh prawn) into the steamer first. Plates take the most time to heat up during steaming. Hence with a preheated plate, your fresh prawns will be cooked in the most perfect timing. 3 minutes has passed and our prawns are cooked. We did not add any additional water but look at the amount of fresh prawn juice that our prawns made by itself! Quickly spread the spring onions over the prawns and close the steamer lid for another 30 seconds. Heating the spring onions for a while releases its aroma. 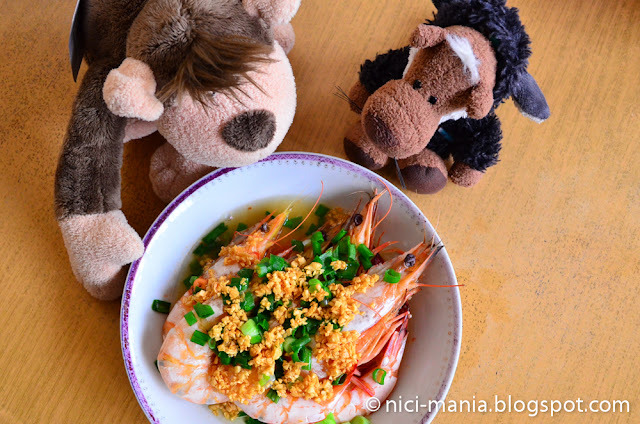 Are you wondering what happened to the garlic in our garlic prawn recipe? Garlic goes last into our garlic prawns. 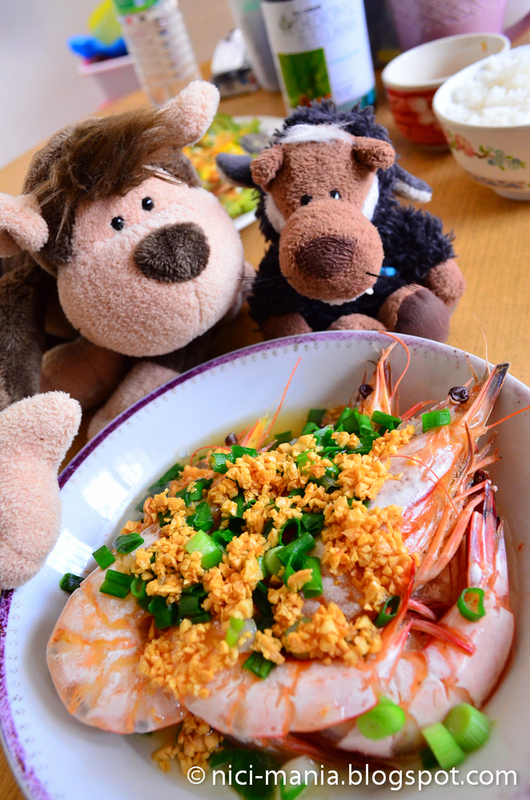 We only poured half the fried garlic in oil over the prawns, you can add your one whole bulb of fried garlic into the prawns but that would be too luxurious! We conservatively kept half of our fried garlic in oil for future use. This pure prawn sauce from our garlic prawn is so full of prawn sweetness with a hint of spring onion and a strong garlic aroma. It taste so good only because we used fresh prawns from the sea. 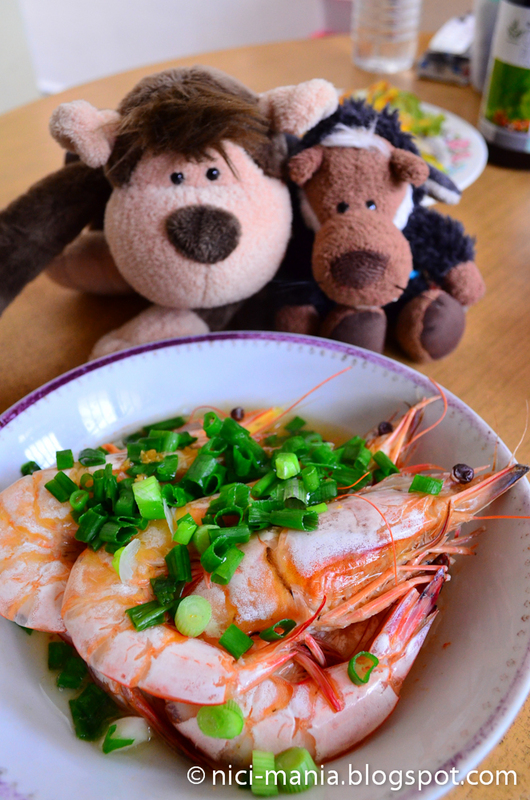 Yum yum, Hugo Wolf wants a bite of the garlic prawns too! The freshness of the prawn is just unbelievable and the prawn meat's texture is almost like crab's meat! Of course for those who live near the sea, you've been eating fresh prawns and fish everyday and won't feel our excitement. 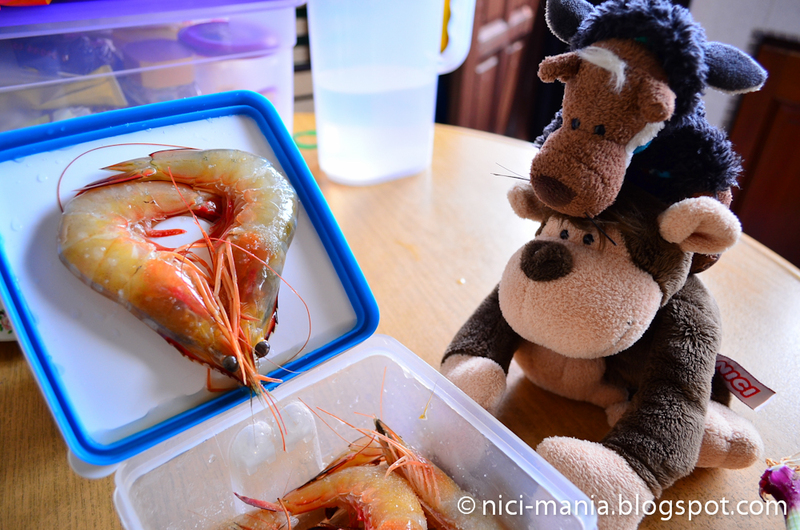 Hope you enjoyed today's simple garlic prawn recipe with fresh prawns brought to you by Hugo Wolf and NICI Monkey! How simple than this can a recipe get? Go buy some fresh prawns and cook garlic prawns now. YUM! We are going to try this!